A young boy accidentally activates a time machine in a natural history museum... and so begins a fascinating journey back through time. In this original, exciting story, the boy encounters all sorts of awesome dinosaurs. 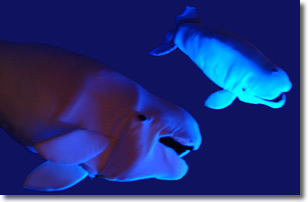 This original, black light show reveals that the oceans, along with the exotic creatures that inhabit them, must, indeed, be protected. 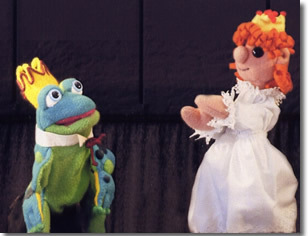 In this enchanting, updated version of the classic fairy tale, Wanda the Witch casts a spell on the handsome prince, turning him into a frog. To break the spell, he now must be kissed by a beautiful princess. There are a few delightful surprises, too. 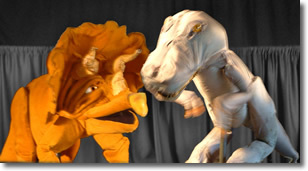 Beautifully designed puppets and music, which will evoke a wide range of moods, enhance this production. In this original adventure, a young boy and his father embark on a jungle safari. Jeremy befriends a lion cub and they each learn something about prejudice as well as each other. This is a touching story of friendship. An all-new twist on an all-time favorite. In this updated version, the Wolf and Red both learn some valuable lessons on the way to Grandma's house. Exciting ...educational. 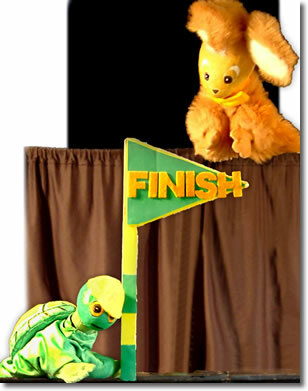 Televised coverage modernizes this Aesop's fable about a great race between a loveable tortoise and an arrogant hare. In addition to the moral that perseverance prevails, good nutrition and exercise are stressed. 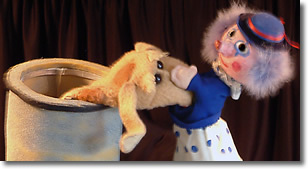 This is an enchanting story about a lonely clown who builds his own dog. Adventure abounds: an attempted dog-napping, a chase and a dramatic rescue! 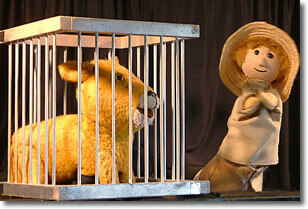 Self-esteem, courage and friendship are central themes in this original upbeat show.